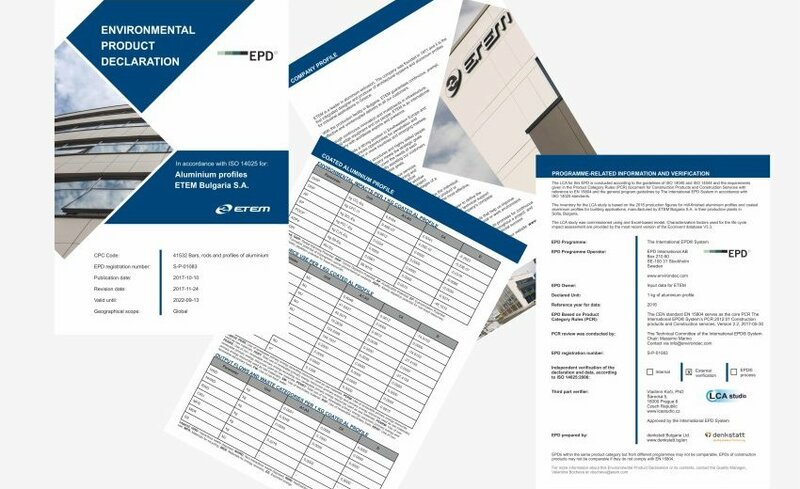 At the end of last year, with the advisory services of denkstatt, ETEM published an Environmental Product Declaration (EPD) for the aluminium architectural profiles manufactured by the Company. The document is an important part of the policy the Company has been developing in response to global climate change and the ever-growing need for sustainable building materials. The environmental characteristics of materials are becoming increasingly important in sustainable construction. The use of products with environmental impact declarations adds an added advantage to the certification of buildings under green building standards. The Having an Environmental Product Declaration is also one of the leading EU criteria for the award of green public procurement for the design, construction and management of office buildings. ETEM's Environmental Product Declaration gives the investors a clear idea of ​​the environmental impact of the company's aluminium profiles and allows comparison to be made with alternative products. Taking all this into consideration, we dare to say that creating and publishing an EPD is yet another successful step forward in ETEM's efforts to maintain high quality products with a limited impact on the environment. At the same time, ETEM is the first company in Bulgaria to register a declaration for ecological products in the international EPD® system and only second ever Bulgarian company holding an EPD. ETEM's Environmental Product Declaration is a document prepared in accordance with international standards and norms, which provides information on the environmental impacts of the production and transport of used materials and energy as well as the generated waste from the activity. The information presented in the declaration is based on the Life Cycle Assessment (LCA) of the products. This method makes it possible to assess the life-cycle environmental impact of a product, including raw material extraction, material production, product manufacture, construction and use and follow-up treatment of the product after the expiry of its life-cycle. The final version of EPD has been verified by a third-party reviewer, authorized by the publishing organization - The International EPD® System.